Ukraine's Prosecutor General's Office (PGO) has announced that it is investigation former First Deputy Prime Minister of Ukraine Andriy Kliuyev over the embezzlement of funds in an especially large amount. "The criminal deal was signed between two companies under the control of Kliuyev with the attraction of UAH 1.5 billion credit from a state-run bank, some of the funds were spent to buy property used as collateral and UAH 610 million was embezzled in favor of the company under his control," the PGO press service reported on Wednesday. 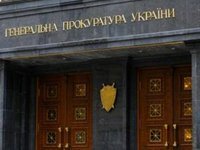 Information on the alleged crime has been included in the state register of pretrial investigations with the preliminary legal qualification under Part 5 of Article 191 (embezzlement of property via abuse of office) of the Criminal Code of Ukraine. Kliuyev could be sentenced to up to 12 years imprisonment if found guilty. Kliuyev was a lawmaker of the Ukrainian parliament of the fourth, fifth and sixth convocation. From February 14, 2012 to January 24, 2014, he was Secretary of the National Defense and Security Council and from January 24, 2014 to February 16, 2014, he was Head of the Presidential Administration of Viktor Yanukovych.